Double thickness base, stays flat, spreads heat more evenly, suitable for gas and electric cooktops. Base hard anodised for more efficient heat absorption. Made from pure virgin Aluminium, exterior mirror polished. Improved pressure regulator - saves more fuel. Inside-fitting safety lid will not open until pressure falls. Hawkins IH30 Silver 3 Litre Hevibase Aluminium Induction Model Pressure Cooker is a premium quality Pressure Cookers from Hawkins. Moglix is a well-known ecommerce platform for qualitative range of Pressure Cookers. 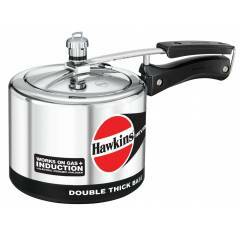 All Hawkins IH30 Silver 3 Litre Hevibase Aluminium Induction Model Pressure Cooker are manufactured by using quality assured material and advanced techniques, which make them up to the standard in this highly challenging field. The materials utilized to manufacture Hawkins IH30 Silver 3 Litre Hevibase Aluminium Induction Model Pressure Cooker, are sourced from the most reliable and official Pressure Cookers vendors, chosen after performing detailed market surveys. Thus, Hawkins products are widely acknowledged in the market for their high quality. We are dedicatedly involved in providing an excellent quality array of Hawkins Pressure Cookers.